Czech company Lukov Plast, a producer of injection moulded plastic parts, electronic components and electrical sub-assemblies for the automotive industry, reports considerably faster inspection cycles and feature measurements following the purchase of a Nikon Metrology LC15Dx laser scanner. Increasing customisation and complexity of the parts, which are used mainly in the vehicle interior, air conditioning system and control units, places a high demand on the inspection department and requires the use of diverse metrology equipment. Some components are safety critical, including those used in autonomously driven cars, and all need to be of the highest quality. Miroslav Pavlu, measuring technician at Lukov Plast explained, "To manufacture assemblies and components that will withstand regular daily use, parts are subjected to various life cycle and climatic tests as well as quality assurance (QA) procedures and analysis to assess performance. "Previously, QA involved using various manual gauges and taking touch-probe measurements on a co-ordinate measuring machine. Larger plastic parts in particular were problematic to inspect using tactile techniques, as they were difficult to clamp without distortion." To control the production of injection mould tools so that manufacturing processes could be steered correctly from the outset, as well as to measure the plastic parts produced, it was decided that inspection needed to be faster, more efficient and more accurate. The ability to check a part against the CAD model and highlight areas of concern using colour mapping was another reason to consider investing in newer technology. An upgrade from Nikon Metrology was deemed to be best solution due to its cost effectiveness and the supplier's extensive experience of retrofitting to third-party systems. Additionally, its LC15Dx laser scanning technology with Focus point cloud software was considered best-in-class. Introduction of the equipment has exceeded the expectations of Lukov Plast in many ways. The colour map is a major benefit in both its speed and simplicity for sharing information with colleagues. The solution also provides greater efficiency in meeting measurement requirements, for example by being able to align to certain features of a part or using RPS points, or to create a BestFit alignment to CAD of the whole part surface. Mr Pavlu added, "The laser scanner has accelerated measurement by about 50% and the creation of programs for new parts is about 40% quicker. Costs are also lower due to the use of less dedicated fixtures than are needed for traditional tactile inspection. Furthermore, the fact that the colour map is easy for our colleagues and customers to understand, without in-depth metrology knowledge, speeds measurement evaluation considerably. The result is a shorter time-to-market." 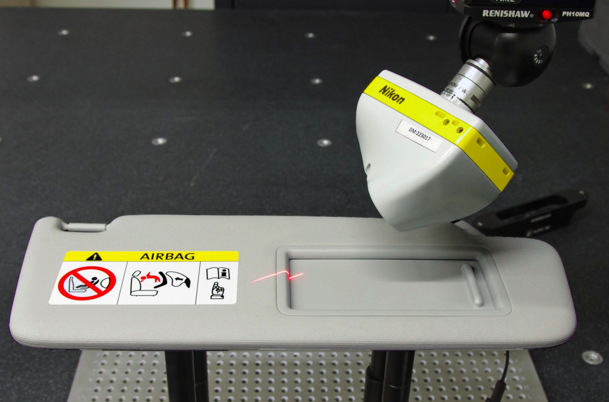 The LC15Dx non-contact laser scanner is used primarily in the engineering department at Lukov Plast. However, with CAD comparison and its ability to reveal undesired distortions, the development department also makes use of the scanning equipment to test new products and prototypes.